This special episode of the Substance series is a follow-up with Jonathan Becher, Chief Digital Officer at SAP where we discuss what it means to create digital shifts today. 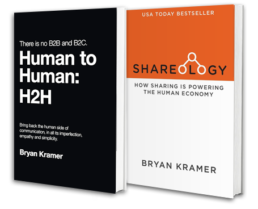 The original in-depth and personal interview in 2014 revealed how Jonathan (at the time the Global CMO at SAP) defined “Social Business” and how it enabled him to profitably manage marketing within a massive 77,000 employee, 20 billion dollar organization. Now 2.5 years later, he has transformed his role at SAP to focus on building end-to-end digital business units within SAP as the CDO. Through this transition to digitizing a business model, Jonathan has become a true cultural change agent within SAP. Over the course of the past 16 months, he and his team have identified six key mindset issues that get in the way of a business becoming more digitally affluent; some of which he shares with me during our talk. He has also gained a revolutionary perspective on the widely recognized focus on customer experience by taking it to the next level: complete business model transformation.